Doomsayers and critics have made sweeping statements about how Samsung have caused the decline of Nokia and are on their way to beat Nokia’s supremacy in the mobile phone industry. However, latest press releases from PTI have declared Nokia as the number one mobile phone seller in India. Nokia has captured over 31% of market share with 87% growth in shipments from 6 million units to 11.2 million in 2011. But why is India still fascinated by the Scandinavian cellphone company? 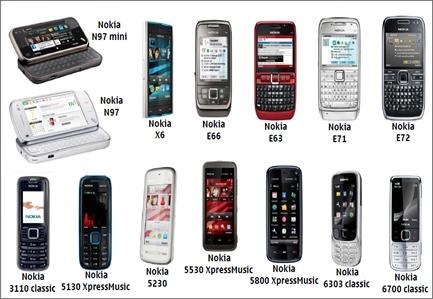 Despite countless brands in the market and majority of them priced lower why does the Indian consumer still loyal to Nokia? This post examines some of the reasons as to why Nokia sells in India? Indians are obsessed with quality in all their products. Consumers are less tolerant to bad quality in manufactured goods, if the service of these products fall below expectations, chances are the consumers will never give the product another try. By nature, Indians are risk averse, they prefer products and brands that require less investment and provide them great service for longer duration. Indians prefer trusted brands such as Maruti for their cars, Hero Honda for their bikes and Titan for their watches for this reason Nokia has always made the best quality products featuring the latest communication technology and the best hardware. Nokia products are known for its call quality & reception, with extremely low call drop off rates as well as long battery life. Another famous aspect of Nokia products are their durability. Nokia phones have sturdy well designed hardware that lasts longer and have catered to consumers for more than 10 years in some cases. Consumers have rarely stopped using Nokia due to malfunctioning devices or because of damage. Nokia has also the highest number of repeat purchases. Another bonus for Nokia products is the higher re-sale value for their products which is a big bonus for customers buying a cellphone. Typical consumer changes their cellphone in 2-3 years and wishes to have a brand that can still fetch a decent price in the market on resale. Here is a video to watch where Director of ASQ is interviewing the Quality and Capabilities director of Nokia about the strategies within the company that ensures this high quality. For Nokia, the journey to be the number 1 in India started not with major focus on sales, but greater focus on service. Nokia has by far the largest number of service centers in India with 718 Nokia Care centers and several more priority partners all over India. It is no surprise then that the typical Indian customer is enamored with Nokia and prefers Nokia to competitors. Nokia has worked hard over the last 2 decades to create strong brand perceptions among Indian consumers. For Nokia, establishing the link between superior product quality and brand was critical, while its advertisements talked about “connecting people” its products ensured that that promise was almost always fulfilled. Nokia’s products had always brought out superior communication technologies and ensured that call drops were as minimal as possible.With exceptional products of high products, a reliable and large service network, Nokia has made itself the most trusted brand in India not just among mobile phones, but even among popular personalities like Anna Hazare. Nokia has made this perception through ensuring high quality, prompt service and truly diverse marketing strategies. Nokia has become an aspirational brand in rural India, while in urban India it has emerged as one of the most trusted brands. For Nokia, the greatest success factor was creating products keeping just about everyone in mind. Nokia has made high end products for those seeking the best technologies as well as low end products for those seeking a rugged phone with greater value for money. 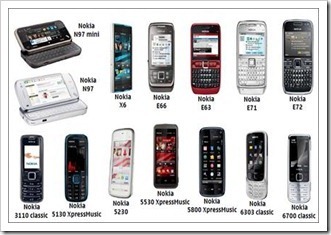 Nokia has released over 200 models over the years in India. Today Nokia boasts of over 36 models selling in the market each catering to a different need and providing slightly different features. For an aspiring consumer, there is always a Nokia mobile just made for him and at his price range. Nokia products start from as low as Rs 930 to as high as Rs 25000 offering myraid options. You may check the Nokia Mobile Price list here. Nokia has launched new range products under the brand names Nokia Asha and Nokia Lumia. The Nokia Asha caters to the upwardly mobile rural/ low budget customer, while the higher end Lumia range products caters to the premium customers. Each models within this range caters to a different kind of need and offers significantly different experiences without being too different in specifications. For eg, Nokia Asha 200 is a great budget phone with dual sim and qwerty keypad while Nokia Asha 300 offers even touch interface. Nokia has always set new trends when it comes to marketing mobile phones in India. Nokia was the first mobile manufacturer to rope in celebrities to promote its products with Shah Rukh Khan and Priyanka Chopra promoting its products, a trend quickly copied by competitors such as Samsung and Micromax. Nokia had even created unique marketing initiatives such as micro-financing for its mobiles in rural india to gain market share. Most recently, Nokia has created a whole new trend with the use of events and active social engagement campaigns such as Flash mobs in public places and Flash cricket etc, to promote its Nokia Lumia range. These campaigns have excited the imagination of the urban consumer and have made the brand even more recognizable. Marketing innovation will keep Nokia ahead in the future as well, creating the right kind of buzz for its new brands while retaining the value of the old brands through service and product quality. Nokia has slowly moved from being specification driven to building on user experience. With the Apps such as Nokia Drive, Nokia Ovi Maps, Nokia Life, Nokia Reading, Nokia messaging etc, which have already become popular among consumers. Nokia Life has thrilled rural consumers such as farmers, who get live precipitation and weather updates of their location. Nokia has enhanced the experience of a feature phone for a Rural consumer with these free to download applications. For the enterprise consumer, Nokia provides free push messaging service called Nokia Messaging that has been well received as well. Nokia OVI music with unlimited music downloads has thrilled countless young consumers by providing a legal and affordable channel to download music. For Nokia, the journey has been long and hard these past 2 decades. It has fought its way into the homes of every household in India and is fighting hard to stay in. Indians today identify Nokia not as an exotic foreign brand, but as one of their own thanks to incredible product quality, reliable service, innovative marketing efforts and the many useful Value added services that Nokia has provided. Nokia has continued to focus on the basics of providing high quality products at every imaginable price range for all kinds of consumers. While competition has definitely grown over the years and grown stronger, it is debatable whether Nokia will continue to rule the hearts, minds and market share of India. Nokia has always been my 1st choice…i recently purchaged Nokia Asha 303…it is giving excellent service….be it battery or any other application..it’s superbbbb!!!!! hats off to u Nokia..wish ur success & prosperity in all aspects.. I have always using nokia phones they are the best. for a change last year I bought a samsung wave 2 S8530. But I am very much dissatisfied with the performance of the phone. It hangs a lot, call drops & applications terminate while using. It’s interesting that you haven’t talked about smartphones and Nokia’s late entry! Smartphones will soon become ubiquitous and Nokia’s lack of early mover advantage is unlikely to work in their favor. This post was more about “now” and our view on why Nokia phones sell inspite of all the obvious issues. Having said that with Lumia range of phones being introduced and Symbian holding its own, this may be an interesting fight to watch out for. I think we need to wait for one year. Nokia surely looks like falling down (people talk about this fact while buying phones)! Looks like Lumia can put a pause to people buying smart phones from Samsung, but that's something we need to look out! Nice Post and makes lots of sense!